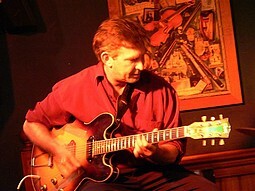 Steve Brien spent most of the 90's living in the USA, teaching and playing gigs in the greater New York area with many prolific artists including Giacomo Gates, Ali Ryerson and Ralph LaLama. Prior to this, Steve had established himself on the Sydney scene as a sought-after sideman with artists including the world-renowned Dale Barlow, Keith Stirling, Errol Buddle and Don Burrows. He also toured internationally at this time with many groups - most notably the "James Morrison Quartet". Presently based in the eastern suburbs of Sydney, he holds a Masters Degree and teaches Jazz Guitar at the NSW Conservatorium of Music. Steve works consistently with leading local and international jazz artists and can readily assemble a top line-up as required.